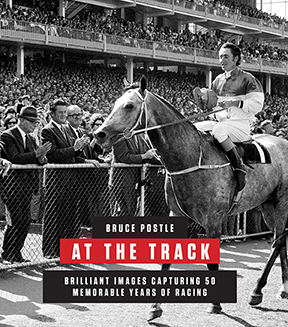 At the Track showcases 155 of Bruce Postle’s greatest images from more than 50 years covering events at racetracks across the country. These photographs display the colour and character of horseracing in Australia, from glory to disappointment, and tumbles to triumph, revealing the drama on and off the track. Postle’s special skill is in capturing the unique bond between the horses and the people who work with them.